YellowKorner wishes to provide an outlet for expression for talents from various movements in photography. The only requirement is a truly artistic approach. 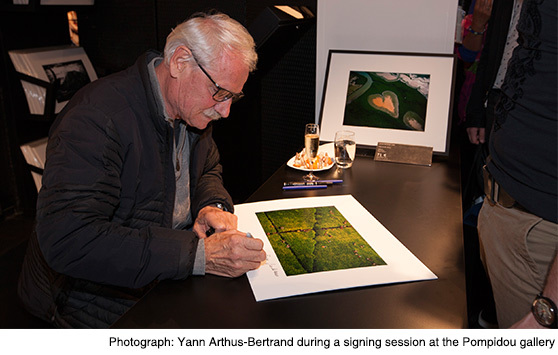 Contemporary artists thus rub shoulders with the great names in photography (Eugène Atget, Man Ray, Jean Dieuzaide, Slim Aarons, Matthieu Ricard, or Yann Arthus-Bertrand), or period photographers (Kusakabe Kimbei, Nadar, or Léon Gimpel). So YellowKorner is a place where the great talents of yesterday, today, and tomorrow meet. Under the aegis of the founders, an art committee comprising a dozen experts selects YellowKorner photographs. Each member of this committee is an expert in a specific photography movement, ranging from 1880 to the present day. As talent scouts, they are also in charge of selecting the most gifted young international hopefuls of their generation in the field of art photography. A number of these artists, who were once yesterday’s hopefuls, are now ranked among the most acclaimed photographers of today. YellowKorner was thus able to showcase the likes of Laurent Baheux, Formento+Formento, or Lee Jeffries, early in their careers. All YellowKorner photographs are non-digital prints produced by the expert hand of our professional Zeinberg laboratory. 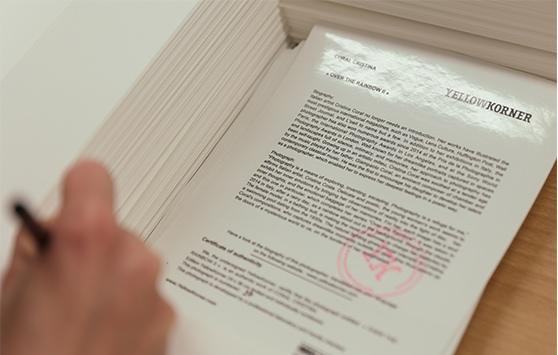 Under the artist’s supervision, the prints are numbered and a certificate of authenticity is provided. With the photographer’s consent, a single photograph can be made available in one or more formats: Classic, Colorful, Large Format, Giant Format, Collector, or Prestige. Each format respectively corresponds to a specific limitation: 5000, 999, 500, 200, 100, or 50. For further information, explore our formats and finishes. YellowKorner democratises art photography through a network of nearly 80 galleries worldwide. Each of the galleries satisfies a requirement: to be a place of culture and conviviality, for exchanges between the public and the artists through events, exhibition openings, and classes, so that the public can discover the art of photography. It is precisely this spirit of cooperation that drives YellowKorner’s teams. 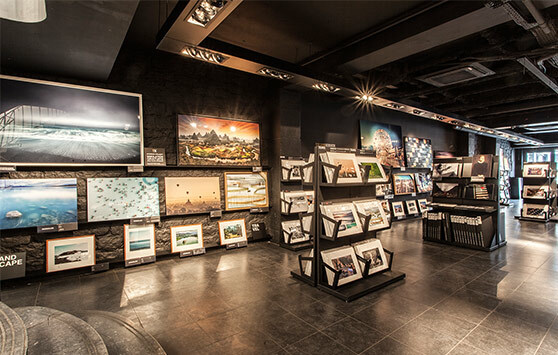 Our gallery owners place all of their passion and expertise at your service, offering to guide you during your visit and assisting you in making new discoveries. The online gallery yellowkorner.com allows you to access the full YellowKorner collection. All of the photographs are available online in all formats and finishes. You will also find exclusive content such as photographers’ biographies, anecdotes about their artworks, and brand-new photographs that have recently been added to the collection. 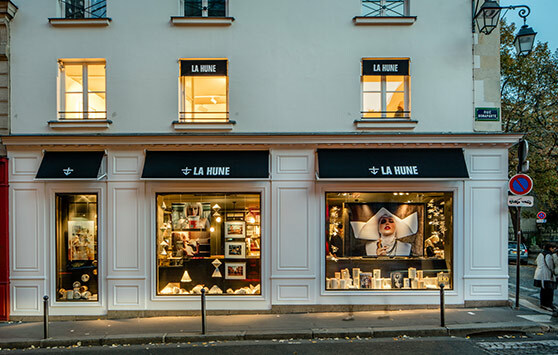 Founded in 1949 in the heart of Saint-Germain-des-Prés, the bookshop-gallery La Hune is a symbol of the cultural life of the neighbourhood. In October 2015, La Hune reinvented itself through contemporary renovations, becoming solely dedicated to photography and a unique site of encounters between the public and artists, with a dynamic events programme. Arranged into three complementary spaces, on the ground floor, it accommodates a revisited YellowKorner gallery containing a large selection of numbered prints available in various formats and a teNeues bookshop presenting an exclusive selection of photography books, including some very beautiful limited-edition art books. The gallery on the first floor presents monographic exhibitions of rare prints, dedicated to the work of internationally renowned photographers.